(Francisco Kjolseth | The Salt Lake Tribune) Dang You to Heck, billed as a family-friendly, Utah-themed alternative to Cards Against Humanity and other NSFW card games is the creation of Jerilyn Pool, of Provo, with an assist from her husband Jeff who were recently assembling themed collections at their home on Thursday, Aug. 3, 2018. Jerilyn holds up a card that reads "...is a slippery slope to apostasy." Provo • Jerilyn Pool places a black zippered container — which, she jokes, “looks like a scripture case” — on her kitchen table and opens it. Inside are hundreds of black-on-white printed cards, and a few white-on-black ones, loaded with jokes and references to Mormon culture. There are also a few handwritten ones, with ideas that haven’t been committed yet to print. “There’s just so many quirky things about Mormon culture and Mormon doctrine,” said Pool, 47, a graphic designer who works out of her home on Provo’s west side. Pool has collected some of those funny things into a card game, Dang You to Heck, which she sells online. 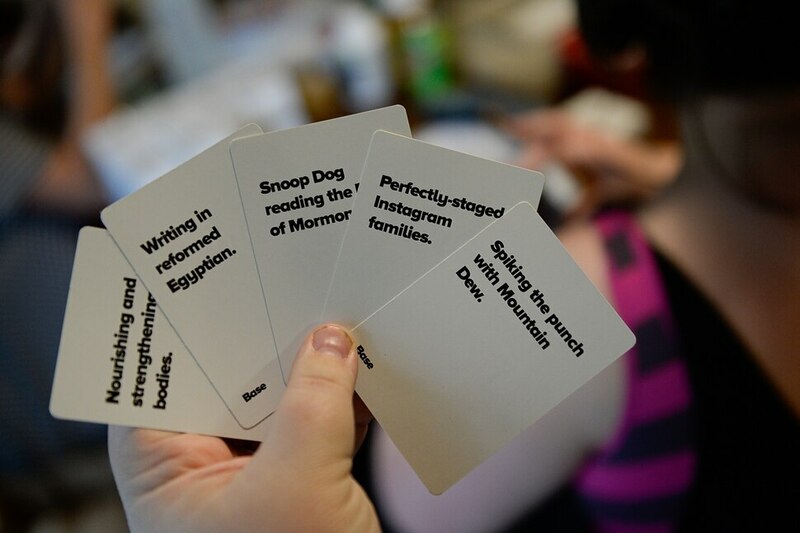 The game is a Utah-flavored version of the popular, and proudly offensive, game Cards Against Humanity. “Is it kid-friendly? Maybe. It depends on your kids,” says the website for the game, which Pool launched in November 2014, but began producing under the Dang You to Heck name in January. (Francisco Kjolseth | The Salt Lake Tribune) Dang You to Heck, billed as a family-friendly, Utah-themed alternative to Cards Against Humanity and other NSFW card games is the creation of Jerilyn Pool, of Provo, with an assist from her husband Jeff as they assemble themed collections at their home on Thursday, Aug. 3, 2018. 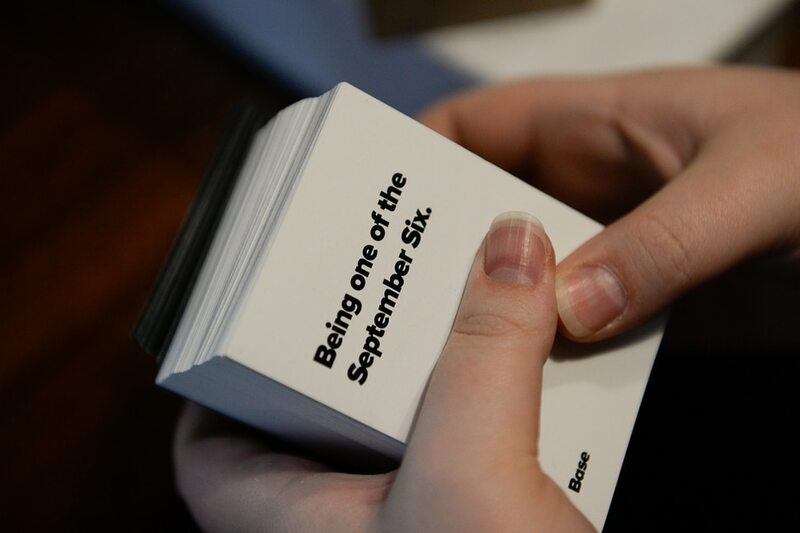 (Francisco Kjolseth | The Salt Lake Tribune) Dang You to Heck, billed as a family-friendly, Utah-themed alternative to Cards Against Humanity and other NSFW card games is the creation of Jerilyn Pool, of Provo, with an assist from her husband Jeff as they assemble themed collections at their home on Thursday, Aug. 3, 2018. (Francisco Kjolseth | The Salt Lake Tribune) Spiking the punch with Mountain Dew, Dang You to Heck, billed as a family-friendly, Utah-themed alternative to Cards Against Humanity and other NSFW card games is the creation of Jerilyn Pool, of Provo, with an assist from her husband Jeff as they assemble themed collections at their home on Thursday, Aug. 3, 2018. (Francisco Kjolseth | The Salt Lake Tribune) Dang You to Heck, billed as a family-friendly, Utah-themed alternative to Cards Against Humanity and other NSFW card games is the creation of Jerilyn Pool, of Provo, with an assist from her husband Jeff who were recently assembling themed collections at their home on Thursday, Aug. 3, 2018. Jerilyn holds up a card that reads ...is a slippery slope to apostasy. (Francisco Kjolseth | The Salt Lake Tribune) Dang You to Heck, billed as a family-friendly, Utah-themed alternative to Cards Against Humanity and other NSFW card games is the creation of Jerilyn Pool, of Provo, with an assist from her husband Jeff as they assemble themed collections at their home on Thursday, Aug. 3, 2018. (Francisco Kjolseth | The Salt Lake Tribune) Dang You to Heck, billed as a family-friendly, Utah-themed alternative to Cards Against Humanity and other NSFW card games is the creation of Jerilyn Pool, of Provo, with an assist from her husband Jeff as they assemble themed collections at their home on Thursday, Aug. 3, 2018. 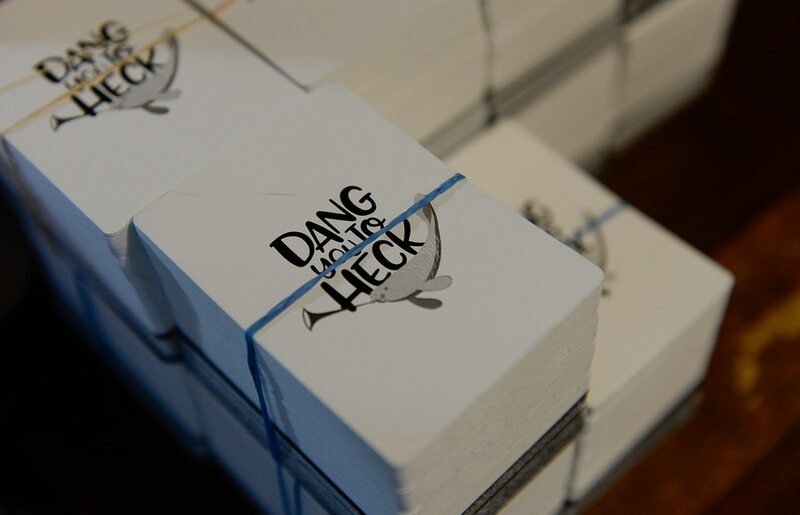 Like Cards Against Humanity, Dang You to Heck starts with a question or a fill-in-the-blank statement — examples: “What happens on a date at BYU?” or “Satan desires _____” — that players can answer with one of the cards in their hand. The funniest answer, as chosen by a designated judge (a position that changes every turn), is the winner of that round. 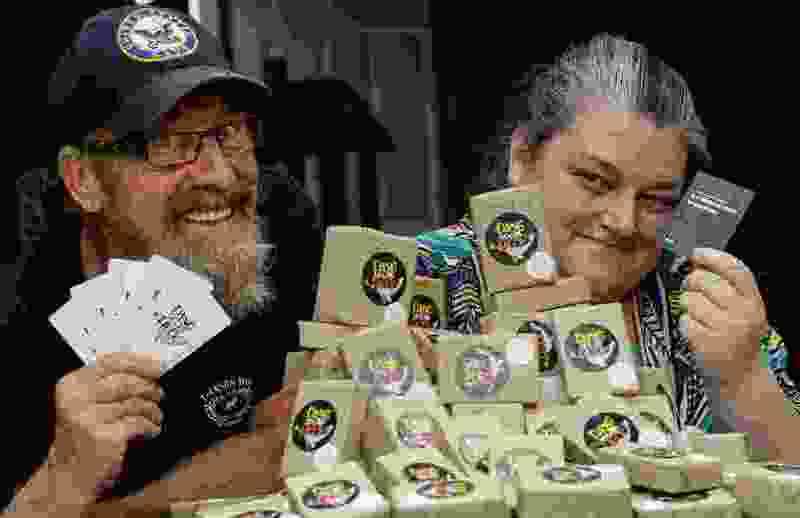 “It’s a way to delve into that part of social norms that isn’t acceptable, but you’re doing it in a controlled environment,” said Richard Howard, a manager at Game Night Games, a game store in Salt Lake City. (Francisco Kjolseth | The Salt Lake Tribune) "Spiking the punch with Mountain Dew," Dang You to Heck, billed as a family-friendly, Utah-themed alternative to Cards Against Humanity and other NSFW card games is the creation of Jerilyn Pool, of Provo, with an assist from her husband Jeff as they assemble themed collections at their home on Thursday, Aug. 3, 2018. 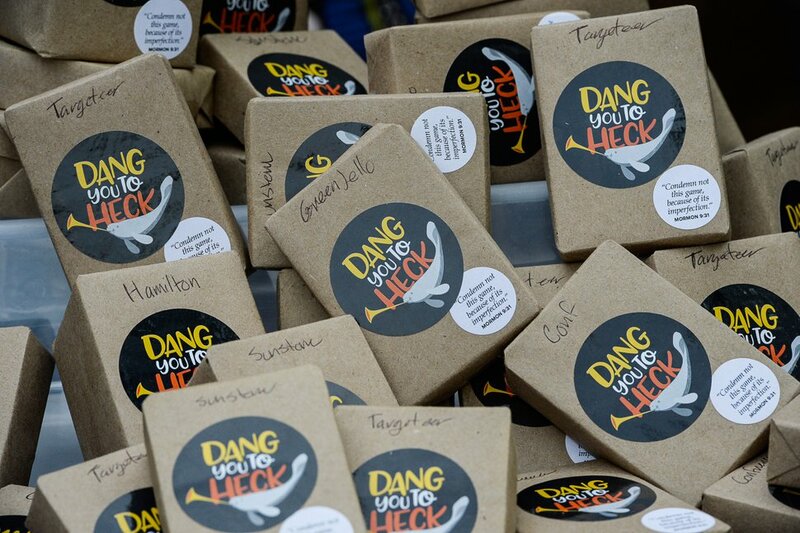 Pool said Dang You to Heck, even with the ironically nonprofane title, can be as nasty as the players’ imagination. The fill-in-the-blank nature of the game allows the answer cards — “shopping for furniture at the DI” or “holding to the Iron Rod” — to be interpreted in more salacious ways. Answers like that, a reference to the mob attack that led to the martyrdom of LDS Church founder Joseph Smith in 1844, may be understandable only to the devout. Others, like a mention of funeral potatoes, are more universally known in Utah culture. The game — along with her day job as a graphic designer (she made the logo for Brigham Young University’s LGBTQ student group USGA) — helps support the nonprofit the Pools run out of their house, Queer Meals, which helps LGBTQ Mormons in crisis. That’s an Article of Faith, isn’t it?